‘We begin, though, with chemistry – don’t think I’ve ever said that at the beginning of an edition of Newshour.’ So said BBC World Service presenter Razia Iqbal, shortly after the Nobel prize in chemistry was announced this week. Despite her mild surprise, the annual announcement from Stockholm is the one time of the year when chemistry is almost guaranteed to make headlines in the mainstream media. This year’s prize, though, was a real gift for journalists. A day after wrestling with a fiendishly abstract physics Nobel (‘topological phase transitions’ anyone? ), here was a mercifully simple concept: molecular machines, thousands of times smaller than a hair’s breadth. There was even B-roll footage of a four-wheel drive molecular car to prove they existed. The prize, shared by Jean-Pierre Sauvage, Fraser Stoddart and Ben Feringa, comes at a particularly opportune time for the field. After spending decades creating a veritable Meccano kit of shuttles, switches, ratchets and motors, chemists are beginning to assemble these components into ever-more intricate devices. Now they have to prove that these mechanical marvels are more than cute toys. 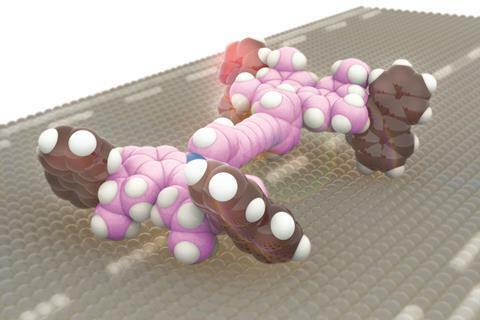 Some are already showing genuine promise in applications from drug delivery to smart materials. But to make further progress, the growing band of molecular engineers will need to forge stronger links with other fields, so that the machines can be put to work in a range of different tasks across many disciplines. The Nobel prize will give them an invaluable calling card to gather the people and funding they need for that effort to flourish. To see how that might happen, look no further than the 2010 Nobel prize in physics, awarded for work on graphene. While that field was already growing fast, the prize helped to give it a huge boost in public attention and funding, attracting more researchers to work on two-dimensional materials, and broadening the scope of potential applications. The prize helped to make the case for the EU’s €1 billion (£880 million) Graphene Flagship programme, launched in 2013. Molecular machines could benefit from a similar boost in the coming years if they can capture the imaginations of researchers and funders. Beyond tangible applications, molecular machines could also have a deeper impact on chemistry and molecular biology. For example, chemists often rely on reactions that tend towards equilibrium. But some molecular machines are now being used to push chemical systems far away from that point by concentrating molecules and accumulating chemical potential energy in the process. These machines are like a cocked gun, just waiting for a chemical or burst of light to pull the trigger and make it change shape, produce an electrical signal or release a burst of molecules. This opens up a new frontier for chemistry – one currently dominated by the biological machines in our cells. Indeed, synthetic molecular machines have already helped to foster a deeper understanding of biomotors. Take kinesin, a protein that ‘walks’ along microtubule filaments within the cell to transport biochemical cargos. Kinesin would randomly move forward and backwards in little steps were it not for adenosine triphosphate (ATP), a store of chemical energy. For years, ATP was thought to provide a burst of energy that swung kinesin’s legs forward, just like the power stroke of a macroscopic machine. Now, thanks in part to questions raised by synthetic molecular machines, it’s clear that something else is happening. The chemical reactions involving ATP help to bind and release kinesin’s feet from the track and their relative rates act as a chemical ratchet to ensure the protein moves forwards, rather than back. The step itself is propelled not by ATP, but by the unceasing jiggling of surrounding molecules. It’s a powerful demonstration that probing the similarities between biological and synthetic molecular machines can offer benefits to both fields. While interdisciplinary collaboration will shape the future of molecular machines, these devices might not exist at all without international partnerships. Stoddart spent the first part of his career working in the UK, before moving to America. In September, he wrote in Chemical & Engineering News about how much his research had benefitted from international collaboration; and back in June had warned it would be ‘out-and-out madness’ for the UK to leave the EU (Chemistry World, June 2016, p38). In particular, he was concerned by the potential loss of this ‘lifeblood of science’ and predicted that UK universities would be ‘at a considerable disadvantage’ when attracting talent from around the world. Shortly after the Nobel announcement, he used the media spotlight to expand on his fears in the wake of Brexit. ‘It puts British science in jeopardy, and I would not be surprised if you see the most able scientists in the country leave,’ he told the BBC. Writing before the Brexit vote, Feringa said that, whatever the outcome of the referendum, chemistry needed to act as a global community to tackle the challenges of the 21st century (Chemistry World, June 2016, p1). This year’s Nobel prize in chemistry underlines that working across borders – both national, and disciplinary – is vital for science to thrive.